The present study aimed to characterise the prevalence and prognostic impact of normocytic anaemia in patients undergoing curative treatment for colorectal cancer. All individuals invited to the first round of bowel cancer screening, diagnosed with colorectal cancer and treated with curative intent from April 2009 to March 2011 in a single health board were included. The modified Glasgow prognostic score (mGPS) was used to quantify preoperative systemic inflammation. Patients were grouped as having microcytic anaemia (Hb < 130 mg/L males, < 120 mg/L females and MCV < 80 fL), normocytic anaemia (Hb < 130 mg/L males, < 120 mg/L females and MCV 80–100 fL), or neither. Of 395,097 patients invited to screening during the study period, 872 were diagnosed with colorectal cancer. Seven hundred seventy-seven patients had FBC measured at diagnosis, of which 78 (10%) had microcytic anaemia, and 180 (23%) normocytic anaemia. On multivariate binary logistic regression, microcytic anaemia was associated with T stage (OR 1.92, 95% CI 1.26–2.91, p = 0.002) and mGPS (OR 1.57, 95% CI 1.10–2.24, p = 0.013), while normocytic anaemia was associated with colonic tumours (OR = 2.51, 95% CI 1.10–4.01, p = 0.025), T stage (OR 1.38, 95% CI 1.05–1.81, p = 0.022), and mGPS (OR 1.52, 95% CI 1.12–2.05, p = 0.007). 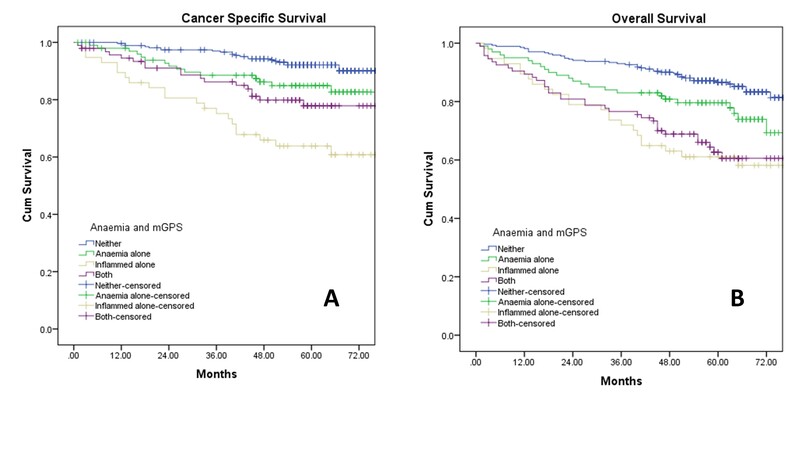 On univariate Cox regression, there was no significant association between microcytic anaemia and cancer specific survival (CSS) (p = 0.969). Normocytic anaemia was significantly associated with poorer CSS (HR 1.55, 95% CI 1.13–2.12, p = 0.007). Normocytic anaemia was associated with systemic inflammation and poorer CSS. Inflammation may drive both anaemia and disease recurrence in these patients, and targeting this process may improve both. The online version of this article ( https://doi.org/10.1007/s00384-018-3211-7) contains supplementary material, which is available to authorized users. Up to 40% of patients undergoing elective surgery for colorectal cancer are found to be anaemic, and up to 30% require allogeneic transfusion of packed red cells (PRCs) during the perioperative period . Such blood transfusions are associated with directly related adverse events such as major and minor incompatibility reactions, and have also been reported to be associated with higher rates of postoperative infective complication, and with higher rates of disease recurrence . 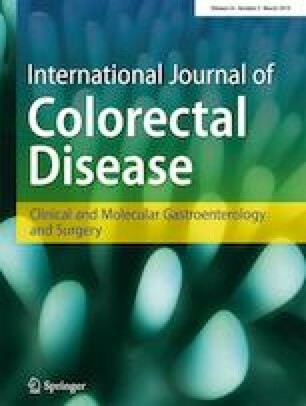 It is thought that the negative impacts of short-term infective and longer term oncologic outcomes in patients undergoing surgery for colorectal cancer may relate to relative suppression of the host adaptive immune system; however, the exact mechanisms remain unclear . The most common reason for perioperative blood transfusion, even in the postoperative period, is preoperative anaemia . Anaemia itself has been reported to be an adverse prognostic factor in patients with colorectal cancer. Traditionally, in colorectal cancer, anaemia has been thought to relate to iron deficiency due to frank and/or occult gastrointestinal blood loss with resultant microcytosis . Therefore, there have been great efforts toward iron replacement therapy in the preoperative period. However, a recent observational study reported that normocytic anaemia was almost twice as prevalent as microcytic anaemia in 356 patients with colorectal cancer undergoing surgery with curative intent . Furthermore, normocytic anaemia was associated with poorer prognosis in this cohort, whereas microcytic anaemia was not. The authors reported a significant association between this normocytic anaemia and preoperative systemic inflammation, characterised by the modified Glasgow prognostic score, which is itself a negative prognostic marker in this patient group . Furthermore, iron replacement therapy would be unlikely to be useful in this group of patients. However, such data was not collected and the cohort size did not allow for meaningful subgroup analysis. Therefore, the purpose of the present observational study was to investigate the relationship between anaemia subtypes, systemic inflammation and outcomes in patients treated with curative intent for colorectal cancer. Details of all individuals who were invited to the first round of the Scottish Bowel Screening Programme from April 2009 to the end of March 2011 in NHS Greater Glasgow and Clyde (NHS GG&C) were extracted from the prospectively maintained NHS GG&C Bowel Screening IT System (original date of extraction January 2012, updated April 2014). They included all individuals in NHS GGG&C aged between 50 and 74 years who were registered with a general practitioner. Methodological data on the screening algorithm used and processing of samples in the SBoSP have been described previously . At the time of study period, this was a combined gFOBt/FIT screening programme. Data were extracted on individuals invited for screening, including the combined gFOBt/FIT result and the uptake and result of colonoscopy. All individuals invited for screening in this first round were cross-referenced with the prospectively maintained West of Scotland Colorectal Cancer Managed Clinical Network (MCN) dataset, and also linked to the Scottish Cancer Registry (SMR06). This allowed the identification of any patient with a diagnosis of colorectal cancer. As screening invitations were biennial, patients with cancer detected more than 720 days after invitation to screening were excluded. Patients with colorectal cancer were then categorised as having screen-detected disease (SD) or non-screen-detected disease (NSD). This cohort of first-round screening patients has been described previously . Patient records were then interrogated on a case-by-case basis to identify further clinicopathological variables for analysis. Preoperative staging techniques, postoperative surveillance strategies and timing were uniform across the centres comprising the health board. Tumours were staged according to the conventional tumour node metastasis (TNM) classification (fifth edition). Polyp cancers that were managed endoscopically and did not undergo formal resection were assumed to be node negative and classified as TNM stage I. Additional high-risk tumour features, such as poor differentiation, the presence of venous invasion, peritoneal involvement and margin involvement, were identified from pathology reports. Patients were classified as having anaemia based on WHO guidelines for males; haemoglobin (Hb) < 130 mg/L and females; Hb < 120 mg/L . Furthermore, anaemic patients were classified as having microyctic anaemia with mean corpuscular volume (MCV) < 80 f/L, normocytic anaemia with MCV 80–100 f/L or macrocytic anaemia with MCV > 100 f/L. Both the modified Glasgow prognostic score (mGPS) and the neutrophil to lymphocyte ratio (NLR) were used as markers of the preoperative SIR and were obtained from preoperative blood results taken most immediately and not more than 6 weeks before surgery. Serum concentrations of C-reactive protein (CRP) (mg/L) were measured using an autoanalyser (Architect; Abbot Diagnostics, Maidenhead, UK) with a lower detectable limit of 0.2 mg/L as was serum albumin (normal range 35–50 g/L). The preoperative mGPS is CRP ≤ 10 mg/L = 0 (CRP > 10 mg/L and albumin ≥ 35 g/L = 1; CRP >10 mg/L and albumin < 35 g/L = 2), associated with cancer specific survival in multiple solid tumours, was calculated in patients for whom serum CRP and albumin concentrations were available . A previously validated threshold of an NLR ≥ 5 was used as evidence of a significantly elevated SIR . Associations between categorical variables were examined using the χ2 test. For ordered variables with multiple categories, the χ2 test for a linear trend was used. Fisher’s exact test was used for assessing associations where the expected individual cell counts were less than five. Variables found to be significantly associated with microcytic and normocytic anaemia with a p value < 0.05 at univariate level were entered into a multivariate binary logistic regression using a backward conditional model. 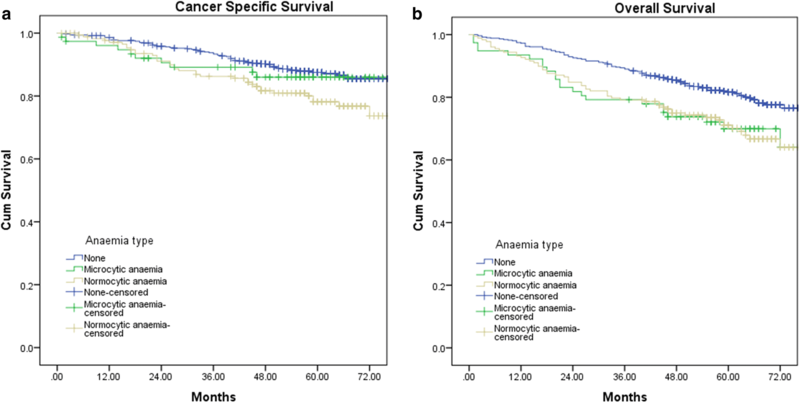 Survival analysis comparing type of anaemia was performed using Kaplan-Meier curves and the log-rank test. Univariate and multivariate survival analysis was then performed using Cox’s proportional hazards model. Variables associated with disease specific or overall survival at a significance level of p < 0.1 on univariate analysis were included in multivariate modelling using backward conditional regression where a two-sided p value < 0.05 was considered statistically significant. Disease-specific survival was defined as time from date of surgery to date of cancer specific death. Overall survival was defined as time from date of surgery to date of death from any cause. Those who died in the immediate postoperative period were excluded from survival analysis. Statistical analysis was performed using SPSS software (SPSS version 24, Chicago, Illinois, USA). Permission for the study was granted by the Caldicott Guardian of the screening dataset and by the West of Scotland Colorectal Cancer MCN Management Group. Data were stored and analysed in an anonymized manner. Of 395,097 patients invited to screening during the study period (Supplementary data 1), within 2 years of their screening invite, 872 patients (0.2%) were diagnosed with colorectal cancer. 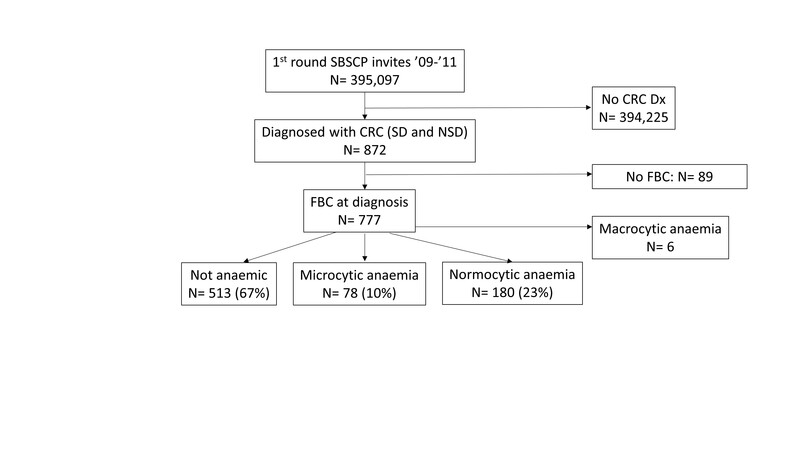 Of these, 6 (0.7%) patients are with macrocytic anaemia and 89 (10%) are without FBC were excluded. Seven hundred seventy-seven (89%) patients had a full blood count (FBC) measured at diagnosis and were included in the study of which 78 (10%) had microcytic anaemia and 180 (23%) normocytic anaemia. The majority of the patients were male (458, 59%), over 65 years old (519, 67%), with non-screen-detected (451, 58%), node negative (515, 66%) disease of the colon (525, 68%). The median follow-up period of those alive at the time of censoring was 63 months (range 32–83). During the follow-up period, there were 210 (27%) deaths of which 116 (15%) were due to colorectal cancer. When those patients without anaemia, with microcytic anaemia, and normocytic anaemia were compared (Table 1), there were significant differences in the proportions of patients with screen-detected cancer (48% vs. 28% vs. 31%, p < 0.001), aged over 65 (63% vs. 73% vs. 76% p = 0.004), ASA 3–4 (29% vs. 54% vs. 41%, p < 0.001), undergoing nCRT (15% vs. 0% vs. 14%, p = 0.001), rectal cancer (38% vs. 14% vs. 24%, p < 0.001), T stage 3–4 (54% vs. 90% vs. 82%, p < 0.001), N stage 1–2 (30% vs. 41% vs. 41%, p < 0.001), NLR ≥ 5 (12% vs. 24% vs 21%, p = 0.002), and mGPS 1–2 (18% vs. 59% vs. 46%, p < 0.001). At multivariate binary logistic regression (Table 2), only T stage (OR 1.92, 95% CI 1.26–2.91, p = 0.002), and mGPS (OR 1.57, 95% CI 1.10–2.24) remained independently associated with microcytic anaemia. At multivariate binary logistic regression (Table 2), nCRT (OR 4.69, 95% CI 1.87–11.75, p = 0.001), colonic cancer (p = 0.025), T stage (OR 1.38, 95% CI 1.05–1.81, p = 0.022), and mGPS (OR 1.52, 95% CI 1.12–2.05, p = 0.007) remained independently associated with normocytic anaemia. When the 535 patients with a recorded mGPS were stratified by T stage and mGPS, there were significant associations with Hb, MCV and the prevalence of both microcytic and normocytic anaemia (Table 3). Of the 535, 166 (31%) had both a T stage of 0–2 and mGPS of 0, while 143 (27%) had both a T stage of 3–4 and mGPS of 1–2. When these two extreme groupings were compared, they were found to respectively have the highest and lowest median Hb (138 vs. 117 g/L, p < 0.001) and MCV (91 vs. 85 f/L, p < 0.001), and the lowest and highest prevalence of microcytic anaemia (2% vs. 24%, p < 0.001) and normocytic anaemia (13% vs. 41%, p < 0.001). At Kaplan-Meier analysis (Fig. 1), those patients with normocytic anaemia had a significantly poorer 5-year cancer-specific survival (78%), than those with microcytic anaemia (86%) or no anaemia (87%) (p = 0.022). In contrast, both those patients with normocytic anaemia (71%) and microcytic anaemia (70%) had a similarly poor overall survival when compared to patients without anaemia (82%) (p = 0.001). When only patients with colonic cancers were included (Fig. 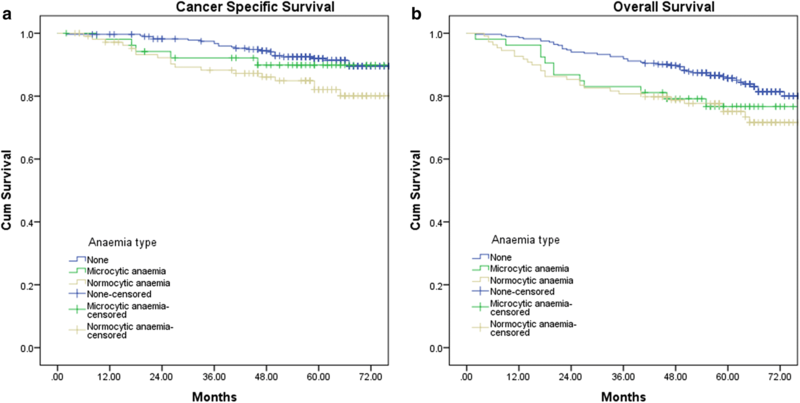 2), the results were similar, in that those patients with normocytic anaemia had a significantly poorer 5-year cancer-specific survival (82%), than those with microcytic anaemia (90%) or no anaemia (92%) (p = 0.031). Again, both those patients with normocytic anaemia (75%) and microcytic anaemia (77%) had a similarly poor overall survival when compared to patients without anaemia (86%) (p = 0.048). When patients were grouped by anaemia (either microcytic or normocytic) and inflammation (mGPS 0 or 1–2) (Supplementary data 2), those patients who were inflamed alone had a significantly poorer 5-year cancer-specific survival (64%) than those with both anaemia and inflammation (78%), those with anaemia alone (85%) and those who were neither anaemic nor inflamed (92%) (p < 0.001). In contrast, both those patients who were anaemic and inflamed (63%) and those who were inflamed alone (61%) had a similar but significantly poorer 5-year overall survival when compared to patients who were anaemic alone (81%), and those with neither anaemia or inflammation (87%) (p < 0.001). At multivariate Cox regression (Table 4), screen detection (HR 0.53, 95% CI 0.29–0.99, p = 0.046), TNM stage (HR 2.89, 95% CI 2.06–4.05, p < 0.001), poor differentiation (HR 2.18, 95% CI 1.20–3.94, p = 0.010), and mGPS (HR 1.37, 95% CI 1.02–1.83, p = 0.035) remained independently associated with cancer-specific survival. At multivariate Cox regression (Table 4), screen detection (HR 0.51, 95% CI 0.31–0.83, p = 0.008), ASA (HR 1.39, 95% CI 1.03–1.87, p = 0.033), TNM stage (HR 1.92, 95% CI 1.49–2.46, p < 0.001), and poor differentiation (HR 2.57, 95% CI 1.57–4.20, p < 0.001) remained independently associated with overall survival. The results of the present study report a significant association between T stage, systemic inflammation and anaemia, both microcytic and normocytic, in patients undergoing curative treatment for colorectal cancer. Although normocytic anaemia appears to be associated with poorer oncologic outcome at multivariate analysis, TNM stage and systemic inflammation were of greater importance. It may be that the systemic inflammatory process is a key driver of anaemia in this group of patients, which could be of great important in their perioperative management. Vayrynen and colleagues recently reported the prognostic significance of microcytic anaemia and its association with the host systemic inflammatory response in a small cohort of patients with stages I–III colorectal cancer . The findings of the present study are in keeping with this work, and indeed provide external validation. The finding that this normocytic anaemia of inflammation is both twice as prevalent as microcytic anaemia, traditionally associated with colorectal cancers due to frank and/or occult gastrointestinal blood loss, and is associated with poorer prognosis is an important one. However, unlike the previous study, the present study also reports an independent association between systemic inflammation and microcytic anaemia. Therefore, it may be that the host innate inflammatory response is a key mechanism underpinning both types of anaemia in this group of patients. Due to the prevalence of preoperative anaemia in patients with colorectal cancer, and its association with postoperative morbidity, up to 30% of such patients receive a perioperative blood transfusion . Allogeneic transfusion of PRCs has been reported to be itself associated with both increased risk of postoperative infective complications  and disease recurrence in patients with colorectal cancer . Therefore, there has been great interest in preoperative iron replacement therapy in anaemic patients in attempt to reduce blood transfusion rates. Several studies, including a recent RCT in colorectal surgery, have reported that parenteral iron replacement is associated with a reduced perioperative blood transfusion requirement when compared to placebo [14, 15]. A further RCT in colorectal surgery compared parenteral and enteral iron replacement finding that intravenous iron supplementation was associated with higher preoperative haemoglobin but finding no difference in perioperative blood transfusion rates . However, no study of iron replacement to date has taken into account the effect of systemic inflammation, in the diagnosis, stratification or outcome assessment of this group of patients . It is clear that systemic inflammation alters both iron homeostasis and erythropoiesis through the IL-6-dependent peptide hormone hepcidin. Hepcidin acts on enterocytes and the reticuloendothelial system to reduce iron absorption from the gastrointestinal tract, and to promote sequestration of iron, therefore reducing iron available for erythropoiesis but not whole body iron stores . This can lead to a state of functional iron deficiency such as that seen in patients with colorectal cancer who have a normocytic anaemia of inflammation . These physiological effects may render iron replacement, especially via the oral route, either less effect or ineffective in colorectal cancer patients with a systemic inflammatory response. Of additional concern is the possibility that inappropriate iron replacement in patients with underlying malignancy may potentiate disease recurrence [20, 21]. Even more difficult in the preoperative assessment of these patients is that fact that the presence of systemic inflammation leads to significant perturbment of the common serum measures of iron status, including ferritin, transferrin, and transferrin saturation, upon which clinical decisions regarding iron replacement therapy and/or blood transfusion are often made . Not only is it unclear, therefore, whether patients who are anaemic with a co-existing systemic inflammatory response will benefit from iron replacement therapy, but it can also be difficult with current laboratory testing to determine which patients are in fact truly iron deficient. The main limitations of the present study include the lack of data regarding measures of iron status at the time of diagnosis, and data regarding subsequent treatment with iron replacement or blood transfusion. Furthermore, not all patients had an mGPS recorded at the time of diagnosis, reducing the sample size for subsequent examination of the relationship between mGPS, T stage and haematological parameters. The retrospective nature of the study coupled with the fact that the cohort was derived from the prevalence round of a screening programme limited the additional data which could be captured. Colonic and rectal cancers were analysed together as the relatively small number of survival events prevented meaningful subgroup analysis. Despite this, the data is in keeping with, and validates similar previous work. In conclusion, the present study reports that systemic inflammation as measured by mGPS and T stage are independently associated with both normocytic and microcytic anaemia in patients with colorectal cancer treated with curative intent. Furthermore, normocytic anaemia, but not microcytic anaemia, was associated with poorer cancer specific survival, although the presence of systemic inflammation appears to of greater importance in this group of patients. Further studies should first seek to examine the impact of these factors on measures of iron status in this population. This would hopefully allow detailed work to study the impact of perioperative blood transfusion and iron replacement in anaemic colorectal cancer patients with systemic inflammation. Subsequent trials of preoperative iron replacement should report the potential confounding effect of the systemic inflammatory response and stratify patients accordingly.